Q2: Is citizen advocacy at its most effective when it generates maximum “noise” on an issue , or do citizen advocates need to attach particular policy prescriptions to the noise they make? In April 2006, 75,000 people assembled on the Washington Mall calling for “peace in Darfur.” The message was simple, and perhaps too simple because a few weeks later the Abuja Accords were signed, fostering an unstable peace in Darfur and a false perception of accomplishment from uninformed activists in the U.S. Messaging and painting a clear picture of the challenges at hand prove important both for policymakers and for activists. Calling for particular policy prescriptions for citizen advocates is essential not only for achieving results but also to sustaining the movement. When building and working with a movement of people calling for a particular cause, it’s essential to establish a clear path towards achieving the ultimate goal. For example, if the ultimate goal is to stop and prevent genocide, we must work to create systems within the U.S. and international community that will enable action when genocide does occur and clear ways of preventing it. Darfur is a clear starting point for pushing this ultimate goal, and to solve the problem in Darfur, we must pressure for peace, protection and punishment. How do we achieve this? By calling for a Special Envoy to Sudan to help facilitate peace, by calling for helicopters for protection and by calling for the arrest of President Bashir. None of these asks are silver bullets to such a complex problem, but they are smaller, tangible steps that help add up to a dynamic solution. Al Gore once said “many people often go from desperation to despair without ever stopping on the intermediate steps of actually doing something about the problem.” Simply thinking about the end result, such as an end to the genocide in Darfur, often breeds paralysis and desperation. Taking it upon oneself to end genocide proves a daunting task. It becomes hard for people to see what they can actually do about the problem. Paralysis takes hold. Inaction prevails. This is why we call upon people to buy energy efficient light bulbs to end climate change. One light bulb does very little, but it creates citizen empowerment over a problem that, when added up to the greater whole of efforts, goes a long way. Informed citizens can lead to informed elected officials, who are held accountable for the action or inaction. Elected officials can become just as daunted by the ask to “end the genocide in Darfur” as the everyday citizen. 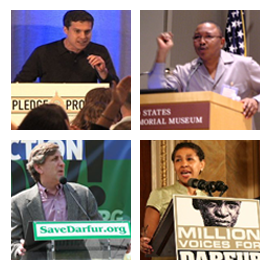 With so many priorities, elected officials must first know that Darfur is an important issue to their constituents but often look to advocates to provide clear ways for them to have an effect on the issue. They cannot “end the genocide,” but they can pass appropriations legislation or a contract bans bill. Activists in the anti-genocide movement have provided productive, tangible ways of attacking such a complex issue such as Darfur. Sure, the atrocities continue, and after seven years, we should be reflecting on our successes and failures. At the same time, I can say with great conviction that much more has been done with citizen advocacy calling for smart benchmarks to such an immense problem than without it. The U.S. has appointed a Special Envoy to Sudan, we have changed the company behavior of multiple major multinational companies doing business in Sudan that directly sponsored the genocide, we have secured appropriations funding for Darfur year after year, the list goes on. No, the atrocities have not ended. The lives of three million people continue to hang in the balance, but had we let the atrocities in Darfur go unnoticed, the state of affairs would be much worse. Of course, we must continue to push forward and find tangible solutions. The activists of today are different from the activists of thirty years ago during the Vietnam era. We are smart advocates who understand that screaming our heads off while holding simple rally signs can only go so far. We have to engage the system and work within it to strengthen it and hold it accountable. We have enabled genocide in part because we have not established the systems to stop or prevent it. Without continuing to challenge the system and work with it, as opposed to shouting at it from the outside, nothing will improve. Citizen advocates don’t just provide “noise;” they provide solutions and government accountability. They help to prioritize our greatest challenges. Activism is about taking it upon oneself to focus on the intermediate steps and actually do something about a problem by educating oneself, others, elected officials and offering tangible policies that serve as steps towards solving the overarching problem. Erin Mazursky has served in a number of roles in the anti-genocide movement including as the co-founder and former Executive Director of STAND: A Student Anti-Genoicide Coalition, a project of the Genocide Intervention Network, Board Member and Coalition Coordinator at the Save Darfur Coalition. Erin currently works as an independent political consultant. I appreciate your post and agree that, as you stated, “we have to engage the system and work within it to strengthen it and hold it accountable”. On the other hand, we activists of thirty years ago did, indeed, in huge numbers, scream our heads off and helped to end the Vietnam war. I was not at the April 30, 2006 Washington rally. I was in Abuja and the perception of the rally from the peace talks was that it was not a peace rally at all. In fact, Assistant Secretary of State Jendayi Frazer was booed when she spoke about the peace negotiations. According to the calls we received, it was an intervention rally. And it was unfortunately timed on the very day that the UN Security Council had, earlier in the month, set its deadline for the completion of the Darfur peace talks. Immediately after the rally one of Abdel Wahid al Nur’s advisers, who was in north America at the time, phoned to tell him not to sign the peace agreement because a better option was in the offing in the form of an intervention. Abdel Wahid upped his demands for NATO troops for Darfur and refused to sign. It is important that advocacy noise is attached to the correct policy prescription. After the Abuja debacle, the Darfur movement began to focus on a negotiated peace to a much greater extent. But the chance had been missed.